Finally getting down to penning my first ever nails related post. Unless you are pretty close to me or is following me on Instagram, you won't know that I'm a huge fan of nail polishes and nail art design. My love for nails polishes started way back when I was 18 years old. Don't ask me how it started, I can't even remember. Nail polish have always and I believe will still be in the long run, one my indulgence. To date, I have about 200 bottles of nails polishes and that's not including those that had gone to rubbish dump. Let's just say that the amount of moolah that I have spent on nail polishes, tools and what not can equates to an air ticket on Singapore Airlines to New York. Trying on new polishes and new designs are one of my biggest pleasure during my free time. It's been more than half a year since I last stepped foot into a nails parlor. Yes, despite that fact that I can paint my nails pretty well, there are times when I do feel the need to pamper myself a little. Another fact that not many people know; I was once a freelance manicurist. I used to help out at my friend's nail parlor every well for a year until I started flying. I love seeing beautiful painted nails. And I find it amazing how fingernails, despite it being so small can be such a wonderful canvas. As much as I love to paint my nails, I don't have the luxury to paint it so often now. But I will definitely will change it once every week unless I'm out of town. 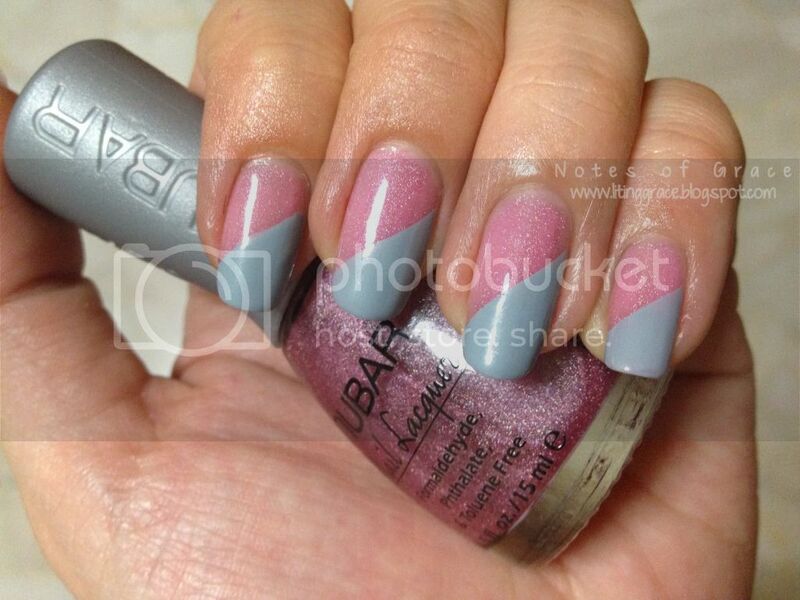 For my first nails post, I'm going to share one of my favorite design, color blocks nails design! Color blocks, lines, chevrons and polka dots, these are my favorite designs. With these designs, I don't have to stick to just one color which can be a little boring at times. However, it can be quite time consuming as well, especially for me. Because I try to make it perfect. For me, if I want to do it, I will make sure it's at least 90% perfect, if it's not up to my own standard, I will remove everything and re-do everything all over again. Which is why sometimes I can spend the entire Sunday afternoon painting my nails. For this design, I used a total of 4 different nail polishes. For the base coat, I used 2 coats of OPI Heart Throb followed by a coat of Nubar Brillant. For the first block, I painted 2 coats of China Glaze Seaspray. To complete the design, I painted 2 coats of the gorgeous A-England Tristam. This is by far one of my most favorite color from the A-England Mythical collection. It's a dark blue polish with subtle silver flecks that shimmers and glitters like a starry sky. It's pretty similar to the OPI DS Glamour but it's not as holographic though. This is one nail polish which every lady or polishholic should own! 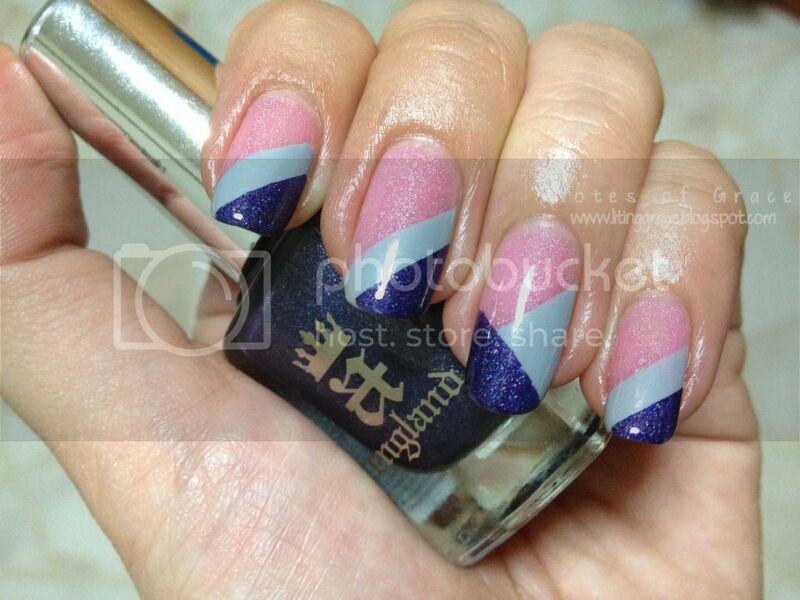 For those of you who are interested in getting Tristam or any of A-England's nail polishes, hop on down to Sgnails. I have purchased from Andrea (owner of Sgnails) and she's my go to if I want to stock up on A-England or Model's Own nail polishes which is not commonly found in any local online shops. All right, that's all for my first ever nails related post. Will be back with more designs and nail polishes swatches soon!